Penrith and the Eden District is the gateway to the northern and eastern stretches of the Lake District National Park. The A686 to Alston, the highest market town in England, takes you over one of the highest passes in England to the Northumbrian Peaks. Penrith lies on the border between the old counties of Cumberland and Westmorland. Just to the south at Shap there are the remains of the Premonstratentian Abbey destroyed by Henry VIII. Catholics, few in numbers after the Reformation, gave witness to the Faith in its martyrs: John Boste of Dufton, Christopher Robinson of Carlisle, William Ward of Thrimby and Thomas Tunsdall of Whinfell. St Henry Morse captured and then imprisoned in Alston was said to have been freed by the Catholic wife of his jailor there. Mass was celebrated at Greystoke Hall, seat of the Howard Family, until 1824. 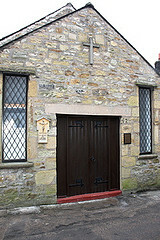 In 1833 a room on the south side of St Andrew’s C of E Church in Penrith became the region’s Mass Centre for its Catholics. It was Fr George Leo Haydock of the old Catholic family of that name from Cottam, north of Preston, who was the stalwart in building the present church of St Catherine’s, though he died before it was opened in 1850 on Drover's Lane. The boundaries were some of the most extensive in England stretching from the Northumberland border beyond Alston, south to Mallerstang Common, thence west to the Kirkstone Pass, then north to Sebergham, and finally east skirting the villages of High Hesket and Armathwaite. Alston is still served from Penrith though Appleby is its own parish. Our first school was opened in 1873 next to St Catherine’s Church, being re-built in 1970. Leave M6 at J40, proceed up Ullswater and Brunswick Roads, round Duke Street, along Portland Place and up Drovers Lane. Go down Stricklandgate, up Portland Place, then left into Drovers Lane to the church. A short one-way stretch on Drovers Lane prevents any approach south down this road. Proceed up Bridge Lane from the A6/A66 roundabout, after the mini-roundabout on Bridge Lane take the third right into Friargate by the John Norris Outdoor Pursuits Shop, bear left into Meeting House Lane, thence past the double and single mini-roundabouts into Drovers Lane. Playground behind neighbouring school or over the road from the school. Disk parking for two hours only in neighbouring streets. The Sunday Vigil Mass is at Alston, 22 miles miles north east of Penrith along the A686 over the Hartside Pass. It is celebrated on Saturday 6pm in the Catholic Chapel of St Wulstan's, Kings Arms Lane whose entrance is from Front Street opposite the Town Hall. If you are new to the parish please complete the "New Parishioners" form below to help us keep in touch. Thank you for completing the New Parishioners form. Welcome to the parish - we look forward to meeting you soon.